“Debjani what is it with the Bhetki Begum Bahar!” Mehebub asked last Sunday while savoring the gravy-based Bengali style Bhetki Begum Bahar with rice. Even I was also having the same. Pasta was done with the lunch and was least bothered about the question. “What do you mean to say? Don’t you like Bhetki Begum Bahar or what?” I asked quite surprisingly! As far as I know, he loves Bhetki Mach a lot. In fact, the market nearby us is loaded with the fresh supply of Bhetki Mach and needless to say I am purchasing the same quite regularly. In general, I make Bhetki Macher Aloo Phulkopir Jhol or a simple mishmash with the Fish-head or at times Pasta’s favorite Chilli Fish. Bhetki Begum Bahar is not a regular dish at my place. It was the day after Eid and I purchased a big fat Bhetki Mach of around 3 Kg, My fish vendor make a few Begum Bahar pieces, some fish fillet for the fish fry and I took the entire fish fat to make Mache Tel Chorchori and used the head and bones to make Chanchra. “You mean you wanted to know the origin of Bhetki Begum Bahar?” I asked while finishing the last fish chunk that was remaining on my plate. Okay, here is what I know about this dish. One of my favorite cookbook, Prajnasundari Devi’s Amish o Niramish Ranna is having the recipe there. Also, I have heard about this particular dish from Dida a lot. What I assume it was started sometimes back in 19th century. Considering the cooking process, I think it is being influenced by the Chinese process of cooking. The dish is rich and maybe the name if I am not wrong! By the way, this was a regular item cooked at home for the feasts, whenever Ilish or Chingri were not on the menu or at times with these two as well. I remember having it during Jamaishasti at Mamar Bari. Dida used to make it. 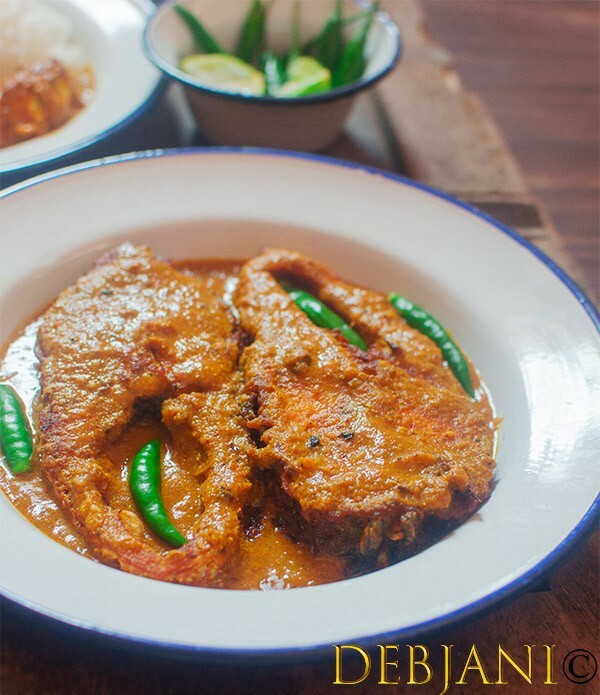 The recipe calls for specially cut pieces of Bhetki fish and in fact, that signifies Bhetki Begum Bahar. 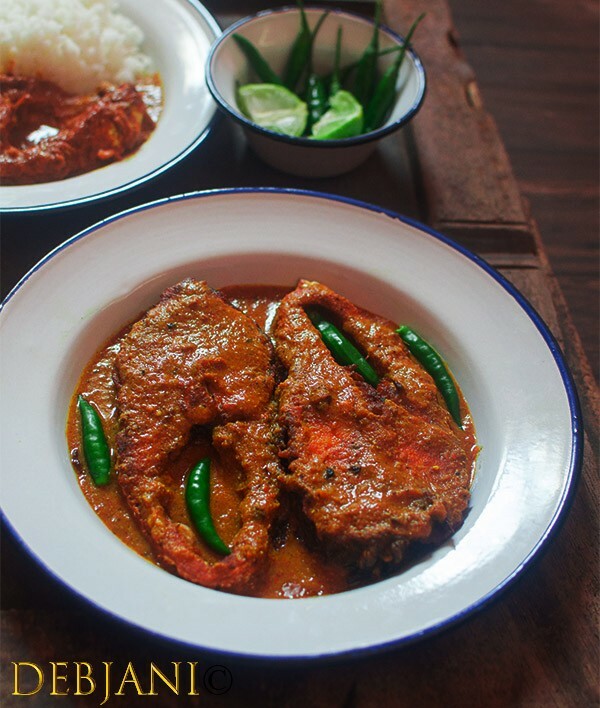 Apart from that, the fish chunks are coated with a paste of All-purpose flour aka Moida which makes it different than other Bengali fish curries. By then Mehebub was satisfied with my answers and we finished our lunch with Kacha Aamer Ambol. Needless to say, I clicked the pictures while cooking and also after cooking the dish so that a blog post can be formed. 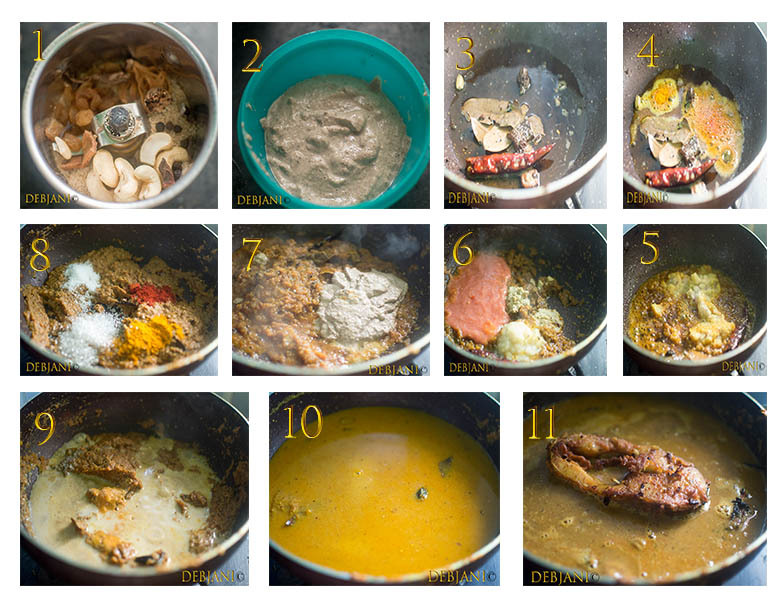 Here’s how I cook Bhetki Begum Bahar and the tips and the tricks. 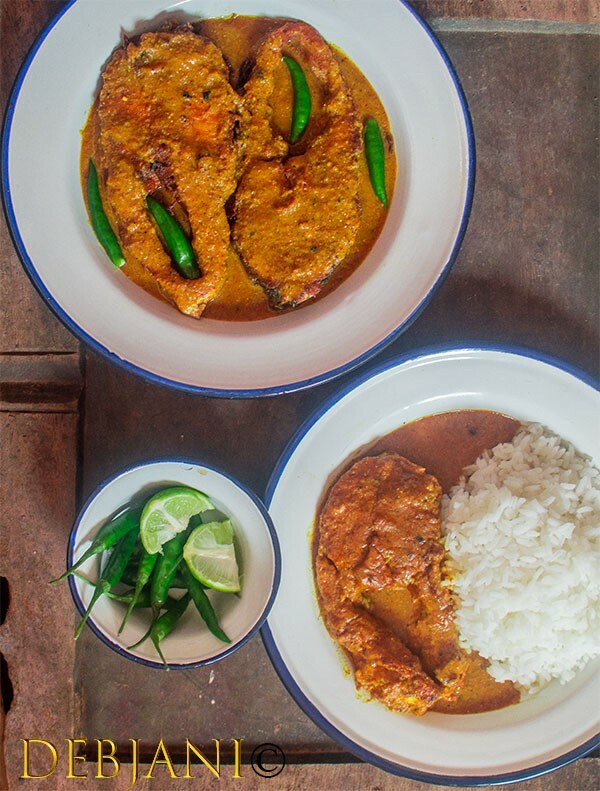 Bhetki Begum Bahar is a signature Bengali fish curry prepared with Bhetki Fish aka Barramundi. 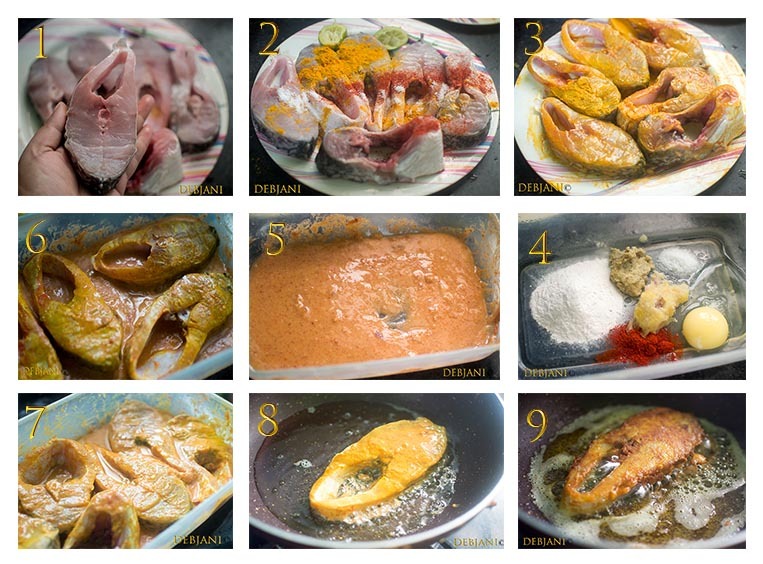 Marinate Fish Chunks with Turmeric Powder, Red Chili Powder, Salt and Lemon Juice for 30 minutes. Make a paste with Egg, All-purpose Flour, Semolina, Garlic Paste, Ginger Paste, Kashmiri Red Chili Powder, and Salt. Coat fish chunks with this paste and leave those for 30 minutes. Soak Cashew nut, Raisin, Poppyseed, Mace, Nutmeg, Black Pepper and Cinnamon Stick in lukewarm water for 15 minutes. Make a smooth paste of the spices and the nuts. Fry coated fish chunks in low flame from both the side till those turn crispy and golden brown in color. Strain the fried fishes from the oil and keep aside. Now add half of the Ghee to the remaining oil. Temper the Oil with Cinnamon Stick, Bay leaf, Dry Red Chili, Black Cardamom and Green Cardamom. Add Onion paste and cook till the onion turn brown in color. Now add Garlic paste, ginger paste, and tomato paste and cook on low flame till the oil leaves the edges. Add the spice paste cook till the raw smell ooze out. Now add remaining batter used for coating the fish chunks. Add Sugar, Salt, Turmeric Powder Cummin Powder and cook till the spices cooked well. Now add 2 Cups of water and bring the mixture into a boil and cook till the gravy thickens. Once the gravy started boiling add fried fish followed by remaining ghee and garam masala powder. Cook for 2-3 minutes and switch the flame off. Don't overcook after adding the fishes as Bhetki is having very soft texture. You may cook the Begum Bahar can be cooked with other Freshwater Fishes. 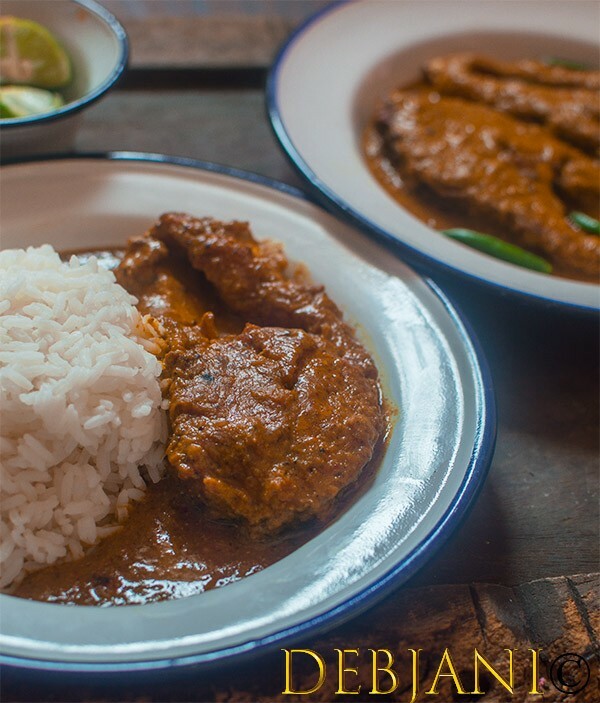 This dish is signified by the special but of the fish chunks and the way the fish is marinated and fried. You may adjust the Red Chili Powder as per taste. Instead of All-purpose Flour and Semolina, you may use cornflour to make the batter. 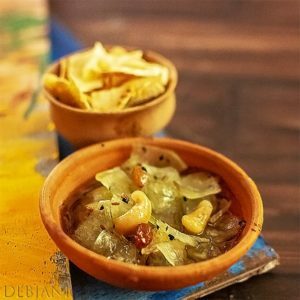 Have you tried the Bhetki Begum Bahar Recipe from Debjanir Rannaghar! « Aam Kola Doi Chire Makha; the bowl full of comfort from both the houses I call home!